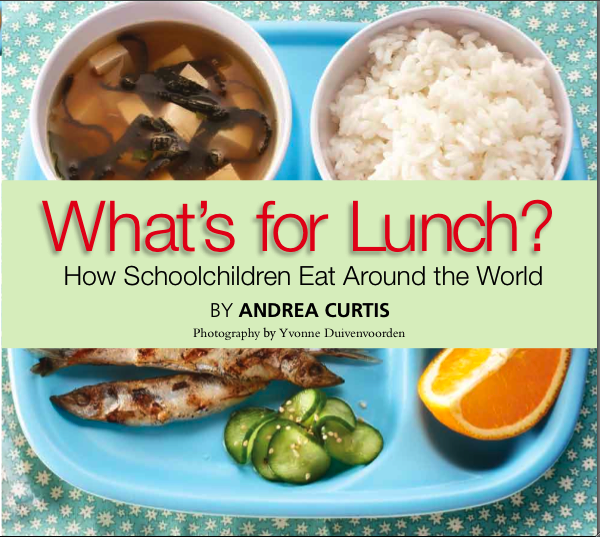 Weighty Matters: Book Review: Andrea Curtis' What's For Lunch? Andrea Curtis is a Toronto based writer and teacher, as well as a fresh whole foods activist. At her son’s school, she initiated a garden program, and she volunteers regularly at a community food centre. Months, and months, and months ago Andrea kindly sent me her children’s book, What’s For Lunch? How Schoolchildren Eat Around the World. I’m not sure why it took me so long to get to (sorry Andrea), but I’m glad I finally did. and she set out to highlight global school lunches, and at the same time, some of the political social and cultural issues that they underscored. With beautiful photographs and stories, Curtis takes young readers across the globe: From the incredible school food of Japan, to a scoop of dal served on paper on a chalkboard in India, to America’s highly processed no-name fast food pizza, to Canada’s bagged lunch as we here in Canada share the dubious honour of being the only G8 nation without a national school meal program. Aimed at children aged 8 and up, Curtis’ book will definitely open young eyes – both to the juxtaposition of our processed North American school fare with just how lucky those of us living in North America truly are, as well as to different cultural, political and ideological attitudes surrounding food. Each school lunch is photographed and used to briefly explain that country’s issues and food attitudes. While I don’t doubt whether or not China has attributed obesity to a lack of exercise and believes short runs or folk dancing will help, the fact of the matter is that inactivity is neither the cause, nor the cure for obesity – in fact I think that message is part of the reason society is struggling so dramatically with dealing with weight. So while I’ve no doubt those two erroneous messages are hammered home to kids everywhere, it’d be great if they weren’t part of this school lunch story. As to whether or not I’d recommend What’s For Lunch? I would. It’s fascinating and I think a great introduction to the issue of food activisim and I’ve given the book to my 8 year old to read. And as for those messages that concerned me up above – they’re few and far enough between that I think they’ll afford me the opportunity for a teachable moment with my daughter where we can discuss those issues in greater detail.